You're mad. You've just heard some of your employees have done something you've told them not to do. If they are otherwise good employees, firing all of them is just going to cost you a lot of money, slow down sales growth, and cause a big drop in morale (and maybe leave you vulnerable to lawsuits). But something has to be done. 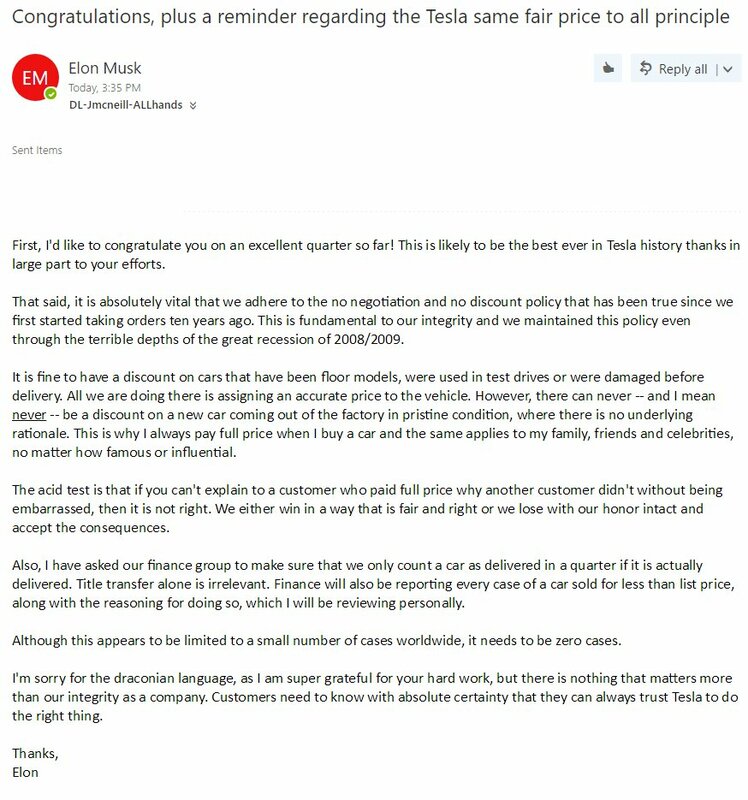 Do what Tesla Motors CEO Elon Musk just did when he found out that several of his employees were violating his strict "no negotiation, no discount" sales policy. Send them a letter. Yes, a letter. It may sound old-fashioned in this day of selfies and instant video chats, but sometimes a brilliantly written letter can show leadership at its best. He starts by acknowledging the good work they are doing. Good leaders acknowledge achievements, keep morale up, and soften criticism with compliments. Next, he explains the situation using clear language and concrete examples. I respect this. Not only is he giving them the benefit of the doubt (hey, maybe you weren't sure about the details), but he is also making sure that if it happens again, nobody can use the excuse that they didn't understand the policy. Notice that he repeats and underlines the word never. Can you imagine employees now arguing that they weren't sure if he really meant it, or they thought there was some leeway available? Not likely. He's also not going on a rant about every little problem the company's been having. He is focused on one problem and explaining it clearly. His message won't get lost in a long list of complaints and problems. He goes on to describe new business processes that he hopes will fix the problem. It shows that he is taking responsibility as well, that as the leader, he will also make changes and try to improve how things are done. He's not only focused on problems, he's thinking solutions as well. Brilliant. Notice while he doesn't engage in outright threats, he does say that he will be personally reviewing the transaction for any car sold for less than list price. If I were a salesperson at Tesla, you can be sure the car would not be discounted. Finally, he ends on a personal note, reminding them how grateful he is for their work and making a strong appeal to their sense of morality and integrity. Leadership at its best. You've heard the expression "don't get mad. Get even"? Elon Musk just demonstrated "Don't get mad. Get writing." Thoughtful, clear, expressive communication goes a long way toward creating a positive company culture. Magic happens when good leadership meets good communication.